This is something you don’t see everyday in the city: four feral boars on a rampage. It all happened in the morning of Nov. 8, around apartment buildings, a school playground and even a department store. The bizarre sight would surely have made a great anecdote for the witnesses, but the damage and risk that the boars make every year have reached an alarming level, data show. According to a Ministry of Environment report, 381 sightings of feral boars were reported in downtown Seoul between 2011 and August 2013. At least 2 were dead and 20 were injured in that period. Including 743 cases reported in other cities and hundreds more in rural areas, the damage amounts to billions of won. Last year alone, boars cost farmers 5.7 billion won ($5.4 million), eating crops such as rice, grapes, apples and vegetables. The loss was 8 billion won in 2011. Currently, the ministry and local governments are joining forces to handle the problem by reducing the population of boars through hunting; blocking paths boars use to enter the city; and holding safety education courses in towns where boars are commonly seen. The ministry has also increased the number of boars that can be captured per authorized hunter from three to six in 19 cities, to control the population and reduce excessive territory competition. Some 14,500 and 12,000 boars were killed by the registered hunters in 2011 and 2012, respectively. This is because one of the most convincing theories that explain feral boars’ behavior is population growth. The higher the population density, the more male boars fight over territory, especially during the mating season in December and January. Based on this theory, the lost boars often enter cities while roaming around the mountain. “Boars are a highly invasive species. They breed about 7 to 13 young at once,” Park Yung-chul, a forest environment protection professor at Kangwon National University told The Korea Herald. Park noted that controlling the population of wild boars without human intervention in Korea has become difficult, as they are now at the top of the food chain, meaning that there are no natural predators. But the theory seems to hold less significance in Korea, where the average population density of wild boars has remained steady at 3.8 boars per square kilometer in the past decade. The National Institute of Biological Resources defines 3 to 5 per square kilometer as a safe population density. “It could also be affected by habitat environment factors, such as what kind of crops or vegetables grow in each area and when those plants are best ripen,” said Shin Nam-shik, professor at the College of Veterinary Medicine at Seoul National University. “It’s a simple theory. They will come down when they have no food up there, and will not come down to town if they have enough,” Shin added. Another possible theory is geographical reasons, according to Park. Park explained that highways and hiking routes artificially developed between and within the mountains are invading animals’ territories. 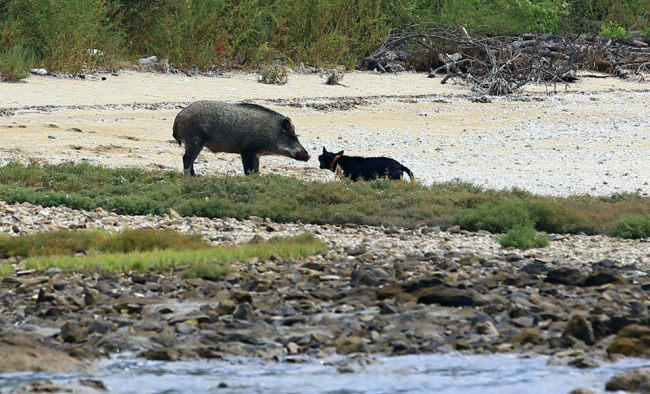 Wild boars whose homes were invaded enter developed areas while seeking new homes. But all experts interviewed agreed that seasonal influence exists, with a typically high number of wild boars seen escaping their habitats during the mating period in the winter. “Male boars have a tendency to escape their habitats when they lose territorial fights against rival boars,” Kim Eui-kyeong, a researcher at the Korea National Park Service told the Korea Herald. The pundits stressed that there is a lack of research on the subject despite the substantial amount of damage every year, mainly because of the short periods that research projects usually last and the difficulty of attaching GPS devices to large, aggressive wild animals. To overcome the problems of short research periods in the country, the Korea National Park Service began a long-term project to analyze boars’ seasonal movements and behavior by attaching the GPS trackers on the species on Mount Jirisan. of what we’ll be getting from this research,” Kim explained. Currently three boars have GPS trackers attached, and the park agency will gradually expand the number to 30. “What’s important is to work out a way to coexist with wild animals like boars. After all, we can’t deny that their habitat areas were reduced because we humans made reckless developments in the mountains and forests. Humans provided them the reason to move,” Shin said. On what to do in an encounter with a wild boar, experts suggest remaining still like a rock and looking straight into the boar’s eyes. “Wild animals intuitively know that their counterparts are frightened when you look away or make big moves to escape. Calmly walk backwards away from the animal without taking your eyes off it, and hide yourself behind a tree or a big object,” Shin said.